What a day this is to play AFL on Thusrdays. Come and join me. The weather kept changing from sunshine to blustery, cold and wet. 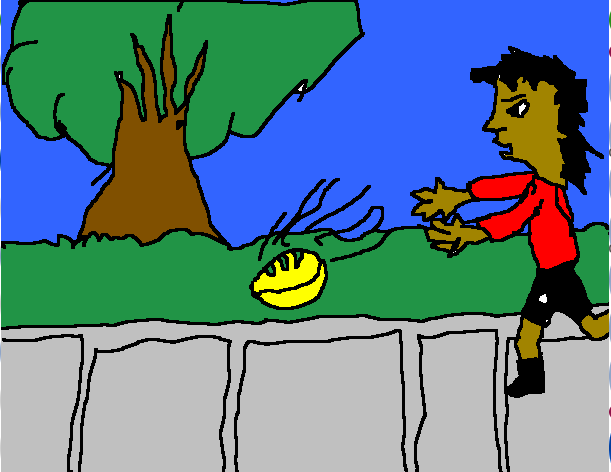 As we were playing the wind was getting to the point of when it would be like a cyclone. As the wind got stronger and stronger I got even weaker and weaker. Our warm up was called “Bumper Jumper”. You play by hopping and using your shoulders to make your partner fall over. While bumping my partner I had fun and I won too! 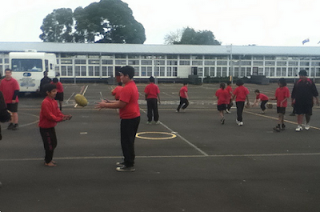 Then we went on the courts to do some AFL skills. One of the skills we learnt was how to bounce the ball while jogging. First we did it on our knees, then while walking and finally we tried jogging. After bouncing the ball we played a game called “kick baseball”. This game helped us practiced lots of our skills. It was sort of like regular baseball, but we kicked the ball. 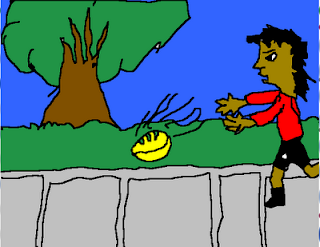 I kicked and ran but before I got to the base I had to bounce the ball. I fumbled and slipped in the mud. While fielding my team caught lots of players out. That is what made our team win. We were filed of excitement when we heard that we had won. Hopefully we get to play that game again. Wow - cool recollection of your AFL practice. Did you get to play an AFL game as well?